I ordered the following between Black Friday and Cyber Monday in 2016. Some of them were good deals, others were small discounts on things I was planning to buy anyway, and there was one in particular that probably wasn’t much of a deal at all. Still, it diversified my stock of miniatures a bit by adding some from Dust Tactics, Dreadball, Relic Knights, and Victorian Miniatures. Miniature Market had a lot on sale in their Thanksgiving Sales but, to be honest, the savings were pretty comparable to their ongoing clearance sales. I picked up the Dreadball Xtreme Sponsor Set, Dust Tactics: Operation Achilles, and Relic Knight: Black Diamond – Sophia Drake. Victorian Miniatures didn’t have a sale but did have a 12 days of Christmas promotion that included a free miniature with each order placed. I ordered two conversion kits, one for adding Camo Cloaks and one of Female Heads with Dress Cap. You’ll have to wait and see which free miniature I got (or squint closely at the image above). 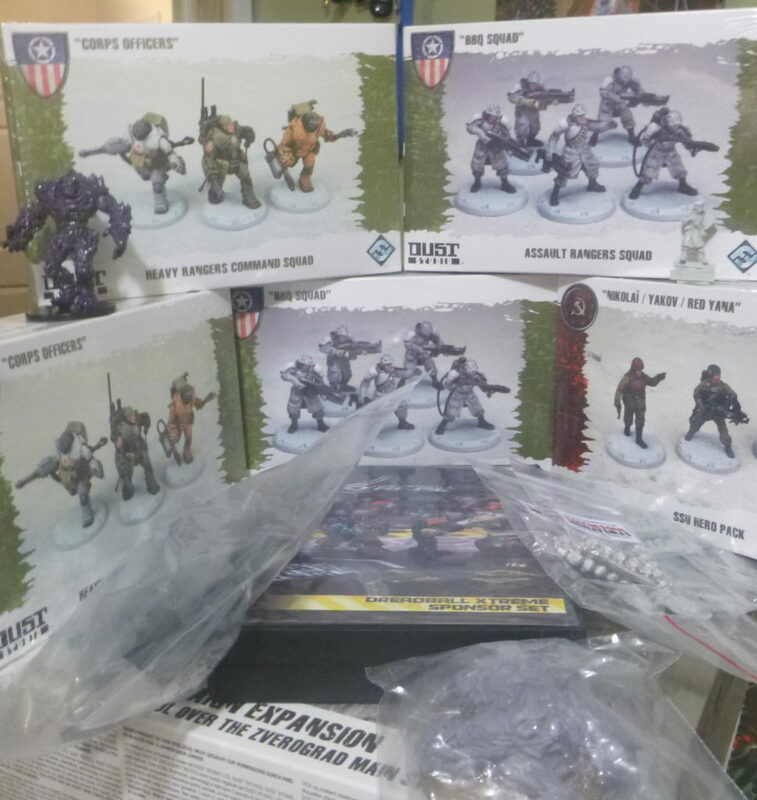 Asmodee had a fantastic timed sale on Dust Tactics miniatures. I picked up Corp Officers, SSU Hero Pack, and the BBQ Squad. The price for each was $4. I probably should have gotten more but I didn’t want to order too many of an untested miniature line. Mantic Entertainment had an hour sale on Plague 1st Gen, a larger miniature that I’d been planning to get as a BBEG in my upcoming Science Fantasy game, so I snatched it up along with the Plague Aberration. I added a Forge Father Stormrage Veterans bundle to try to justify the shipping. In retrospect, the shipping from the UK added so much to the cost that I probably should have just ordered the Plague 1st Gen from ebay. Hasslefree Miniatures had a number of miniatures on sale as part of their “Artemis Black’s” Friday sale. I got Big Charles, Power Armored Kieran, and Laurie. All in all, Asmodee had the best deals by far but Victorian Miniatures had a fun promotion and Miniature Market has ongoing deals comparable to their sale (the takeaway being that, so far, Miniature Market has been a great place to find deals year round). Hasslefree Miniatures has their big sale in October and the deals for Black Friday weren’t quite as good, but their range of sculpts has so much quality and diversity that it was more than worth it.